Based on the signal detection theory, this test assesses the visual detailed registration of complex stimuli under time pressure over a longer period of time. Assessment of long-term selective attention, that is, the visual differentiation of a relevant signal within irrelevant signals; application for people aged 7 years and over. Main areas of application: health psychology, clinical psychology (to assess the ability of visual differentiation as well as neglect phenomena of a visual half-field, e.g. for neglect diagnostics), and performance-oriented aptitude diagnostics. The signal detection theory (by Green and Swets, 1966) describes the perception of weak signals on a constantly changing (flickering) background. It is not limited to visual differentiation of a certain type of signals that are close to the perception threshold. It is much more general and deals with the question: Under which circumstances can a person detect a weak signal surrounded by irrelevant signals that could be confused with each other? This shows a strong link to the statistical decision theory, as for the reaction "Signal exists" or "Signal does not exist" the sensibility to differences is less important than the problem to decide for one of two possible answers with different probability to be correct. The entire screen is covered with dots, some of which randomly disappear while other new ones appear. 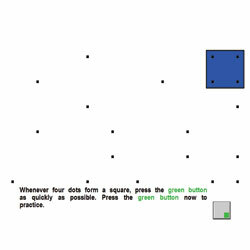 The respondent is required to detect the critical stimulus constellation, that is, whenever four dots form a square. The main variables calculated are the sum of correct, delayed, and incorrect reactions as a measurement for the reliability of the detection process, and the median of the detection time as a measure of the speed of the detection process. Additional part of the test protocol: quadrant scoring (including cutoff scores or distribution sections for average performances). For the variable "number of correct and delayed reactions" split-half reliability coefficients (odd-even method) of between r=0.74 and r=0.85 were obtained, depending on the test form and the comparison sample. For the median detection time the reliability calculated by the same method was between r=0.78 and r=0.84. Construct validity can be assumed because the aspects of performance measured constitute the criteria for the construct of signal detection in accordance with signal detection theory. Studies with extreme groups also yielded very good results. For test forms S1 to S3 norm samples of between N=76 to N=904 are available. In some cases the norms are also available partitioned by gender, age and education. For Form S4 norms are available for N=71 neurological patients. Between 14 and 20 minutes (including instruction and practice phase), depending on test form.